SINGAPORE – Serena Williams has been bad at times before, but the 18-time Grand Slam champion rarely plays horribly. But, in her 6-0, 6-2 loss to Simona Halep, she never woke up and couldn’t keep her balls in court. Without question, the young Halep was very solid, but she didn’t have to put together her best strokes. Really, all she had to was keep the ball in, move it around, and stay away from what could have been a panic when she need to finish the match off. That is exactly what the 23-years-old Halep did, who scored her first win over Williams, and did not shake at closing time. Serena could not keep her forehand in the court, which is somewhat amazing that the American usually crushes her ball and strokes them close to the line. But not this day. Williams dumped it into the net, couldn’t see where the lines were, or even get on top of his heavy spins. Williams ended with 36 errors – in just 14 games – where the forehand errors were somewhere around 27. She may be her best server ever, but she didn’t murder the ball, only put in two aces. When asked about it later, Serena wasn’t messing around. The great Williams was embarrassed early on. Halep came out firing early on, as she wanted to prove that she could stay with her and did, playing much more aggressively then she was in August of 2013 when Williams smoked her 6-0, 6-4 in Cincinnati. But No. 4 Halep has been much better this season, reaching the Roland Garros final where she nearly took down Maria Sharapova and gaining the Wimbledon semis. She moved very quickly and kept pushing forward, keeping Williams deep with her forehand and backhand. Williams tried to slap his balls back, but was so erratic early on that she dropped an f-bomb by the third game. Williams tried to keep into the second set and even thrown out a “C’mon” after a couple winners, but she could not become steady at all. Halep showed a bright smile, while Serena was disgusted. And why not? The 33-year-old Williams loss is the worst match since 1998, when she went down to South Africa Joannette Kruger’s 6-1, 6-1 in Oklahoma City. No. 1 Williams wasn’t sure if she was going to play in Singapore because she has been dealing with a sore leg. But she is going to trot on, because she wants to show that she could win the title, plus she wants the fans she can watch her brilliant play. But Williams did admit to us after the loss that she does not feel fantastic. Not even close. Williams has to face Eugenie Bouchard on Thursday and even though she could be limping, she is going to try very hard. Serena cannot stand losing, but she loves cheering — and winning. Ivanovic pushed away the attention of being No. 1 and had a comeback year in 2014. Advice sometimes comes at you from all angles. That’s surely been the case for Ana Ivanovic during a 12-year pro career that has seen the now-26-year-old reach three Grand Slam finals and rise to No. 1 in the world, a ranking she occupied in 2008 when she won Roland Garros and became only the second Serbian woman to win a major. Since the age of five, when she first picked up a racquet after spotting fellow Serb Monica Seles crushing screech-inducing groundies on TV, since the days she honed her skills in the unlikely environs of a carpeted indoor swimming pool, the consultation — sometimes welcomed, other times not — has come from a variety of voices. It’s come from her mother/courtside companion, Dragana, from her father, Miroslav. It’s come from a battery of coaches, which the Belgradian baseliner seems to go through with a Steinbrenner-like flair: Dejan Vranes, Eric Van Harpen, Zoltan Kuharszky, David Taylor, Sven Groeneveld, Craig Kardon, Heinz Gunthardt, Antonio Van Grichen, Nigel Sears, Nemanja Kontic and, currently, coach du jour Dejan Petrovic, who once mentored AI’s pal Novak Djokovic. But it was in 1999, when she was just 12 and NATO planes regularly roared over her homeland and she was forced to train in the mornings to avoid bombardments, that she received perhaps the most important advice of her career. It was simple, really: You’ve got to work hard, to put in your time off the court before anything can begin to come easy on it. It’s something she’s never forgotten. Ivanovic, who’s gone 56-16 on the year, earned a spot among the Elite Eight at the 2014 BNP Paribas WTA Finals Singapore. Ivanovic’s parabolic narrative is well known. Just as soon as she assumed the role of top dog on the WTA Tour, she seemed to skulk away, tail tucked between legs. She even admitted to as much this summer in New York, telling reporters that she simply couldn’t stomach all that came with being the best in her sport. In total, Ivanovic spent just 12 weeks at No. 1, surrendering the spot first to countrywoman/rival Jelena Jankovic, and a second time to Serena Williams, that time for good. She’s been trying to get back ever since. And the process hasn’t always been pretty. But we’ve witnessed a rebirth of sorts in 2014. She kicked off the year by winning Auckland, then scored her first-ever win over Williams at the Australian Open, shocking the American No. 1 in three sets in the round of 16. She scored consecutive titles in Stuttgart and Monterrey in the spring, downing the likes of Top-10ers Jankovic and Maria Sharapova in the process. (She’s now downed Sharapova three times this year, including a gutsy 6-2, 5-7, 7-5 performance in Cincinnati, where she reached the final.) She dove into the grass-court campaign by taking the Birmingham title. And despite a ho-hum year at the Slams (her quarterfinal showing in Melbourne being the only time she advanced beyond the third round), she’s been hitting the ball with more authority than she has in years. Chalk it up to maturity. And her ability to go back to the basics, back to those words of wisdom she first heard in ’99: You’ve got to put in your time off the court. Ivanovic will be tested early at the WTA Finals. She opens against none other than 18-time Slam champ Williams, a player she’s beaten only once in eight career head-to-heads, on Monday night. The good news? She’s pushed Williams to three sets three times in 2014, including her upset of the American in Melbourne. Is another upset in the making? Stay tuned. Ivanovic steps it up in 2014. Singapore – The BNP Paribas WTA Finals Singapore will begin on Monday. Here are the eight players, some of which are are on fire and others who are struggling. On Sunday, all the players spoke to what is head. Tennisreporters discusses the field, with TR also asks for players as well as journalists who discuss the field. This is Matt Cronin’s first article for TennisReporters.net since his brain surgery last spring. Matt has written for Tennis.com and USOpen.org. Matt: Great to have you back as you return to the work you love and the work the tennis world loves you for! Serena Williams: The US No. 1 has not been as dominate as she was in 2013, but Serena found herself believing her game by winning the US Open and snagging her only Slam in 2014 when she needed the most. Now she has the chance to walk away with the WTA 8 final again if she is cracking the ball once again. Last year in the WTA final in Turkey Serena served and hit her corners when necessary — even when she was hurting — but came through the victory. This year Serena will be careful as she pulled out of Beijing with a knee injury. Williams will play Ana Ivanovic Monday night. Q. How important is the year‑end No. 1 ranking to you? And if you had already had it locked up, do you think you would be here? WILLIAMS: I definitely would be here if I already had it locked up. It’s obviously super important for me. I love being No. 1; I love being the best. But at this at the same time, I’m really glad that I was able to get a slam this year, which was really annoying for me that I wasn’t able to capture one. That was something that was super, super, super important, especially for the goals that I was trying to reach. Simona Halep: The Romanian began to step up last summer and this year she finally showed her self-believe, walking quickly and jumping on the courts. Halep came very close to knocking off Sharapova in the Roland Garros final, but the Russian turned on the afterburners and nailed his second Slam. However, Halep has been rising quickly and could eventual grab No. 1 – if she can win the WTA 8 and a Slam next year. Q. Do you think that actually, say, in the next year you will become No. 1? Genie Bouchard: The Canadian had become relevant early on and hasn’t stopped, grabbing the semis of Australian and Roland Garros, and playing very close at the lines where she earned the runner-up at Wimbledon. She is contending with a left leg injury but is ready to go. Q. When you were here in January, was it possible to look as far ahead as October, and did you think to yourself: I’d like to make it; I want to make it; I’m going to make it here? What were your thoughts about the year‑end finals in January? Bouchard: “It’s the craziest thing, because I was with Chrissy [Evert] in this exact room at this table in January launching the WTA Finals and the Road to Singapore. So I don’t know who believed that I would be here in October, but being here in January motivated me so much. It was an amazing city, and seeing the glamorous side of what the finals are inspired me so much to try and make it here. Big day for Southern at USTA national Junior Team Tennis Championships. Madison, MS (advanced) and Woodstock, GA play for national titles. Q. Does 2009 [when she won her first and only Slam at Roland Garros] seem like a long time ago? Ivanovic: It feels like the other life. Yeah, definitely does. I think in a way we are very fortunate because we travel so much. We compete week in, week out. I feel like there is so many experiences that we have weekly. You know, even Auckland seems like two years ago, because so many things happen in the meantime on and off the court. Also you change a lot. You change your views on things. This is what I feel happens. So I feel like I’m different person comparing to 2008 or 2009. I experienced lots of good and bad. You learn so you much about yourself, too. In that sense as well it feels like long time ago. Maria Sharapova: The world No. 2 recalls back in 2004, in LA and besting Williams in the final, the last time she took down the great Serena. She has played the year pretty well, winning the French Open and two other big wins in Madrid and Beijing. If Serena falters, Sharapova could snare from the top spot to end the year. Q. Just talk about 2004, WTA against Serena, just your memory, your thought. Sharapova: Well, first I couldn’t believe that I was part of a field at that point in my career. Yeah, I was in Los Angeles where I had been training with Robert [Lansdorp] for so many years. It felt like a home tournament in a way for me. I remember the players. It was, of course, a very tough field, as always. Just going through the draw there and the way that I felt and the way I played. I’ve seen some clips as well, very inspiring. Certainly hope I can do that here again. Petra Kvitova: The Czech has been much more consistent by being free from injury and rarely backing down. She grabbed the 2014 Wimbledon by striking the ball so hard that she was untouchable. The lefty recently won Wuhan earlier this month and has a chance to reach the yearend No.1. But she is going to play nearly perfectly to win the crown. 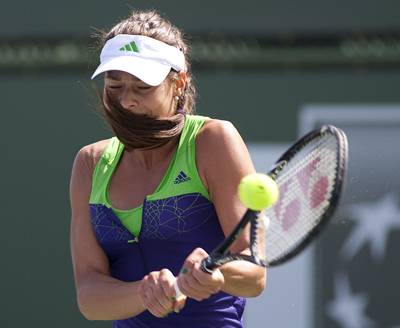 She will face Ana Ivanovic on Monday night. Q. It seems like your nerves, we don’t see them as much anymore. Why did that happen this year? Kvitova: “I’m more relaxed on the court. I have a little bit more confidence probably. From the Wimbledon I showed maybe that I can play great tennis again, and that’s really what I missed for the three years. So from that time I think it’s much better. I can enjoy the tennis, I can really play, and I know that I love to play tennis. So that’s very important, to know it. Agnieszka Radwanska: The Pole has been very consistent over the past five years or so but has not been fantastic this season. She did win Montreal and reached the final of Indian Wells, but falling to Dominika Cibulkova in the semis of Australia has really hurt her overall. She needs to step up big time and end the year at a high note. Q. What would make you really happy at the end of this year and then all of next year? What would make you super happy? RADWANSKA: Well, of course, I think winning Grand Slam as well. I think this is the tournament that we all waiting for to get a title. I didn’t do it yet; I was close few times but still didn’t get it. So, I think winning Grand Slam, that will make me really, really happy. Caroline Wozniacki: Even though she is rising again, Wozniacki is only reached the top 8 when Li Na retired. However the former No. 1 has played better than in years, reaching the US Open and stepping inside the court at hard courts. Wozniacki, from Denmark, may not have figured out to upset Williams, but she is confidence to trouble anyone else at the WTA. Q. As you were sort of slipping down and then making your way back up, did it feel like it was a long way to go, or did it feel like you were pretty close to where you had been? Wozniacki: No, didn’t feel like a long way to go. I never really looked at the rankings, but I definitely totally stopped when I went down to 18. I’m like: This is depressing. I don’t want to be down here. At the end of day, I just told myself, “Doesn’t matter if you’re No. 1 or No. 18. At the end of the day, you have to compete with the same players.” A lot of girls play so well now so it’s never easy. I just thought if I play well, the ranking will come back up soon. I started playing well. I started finding my form, and then the ranking just came up really quickly.